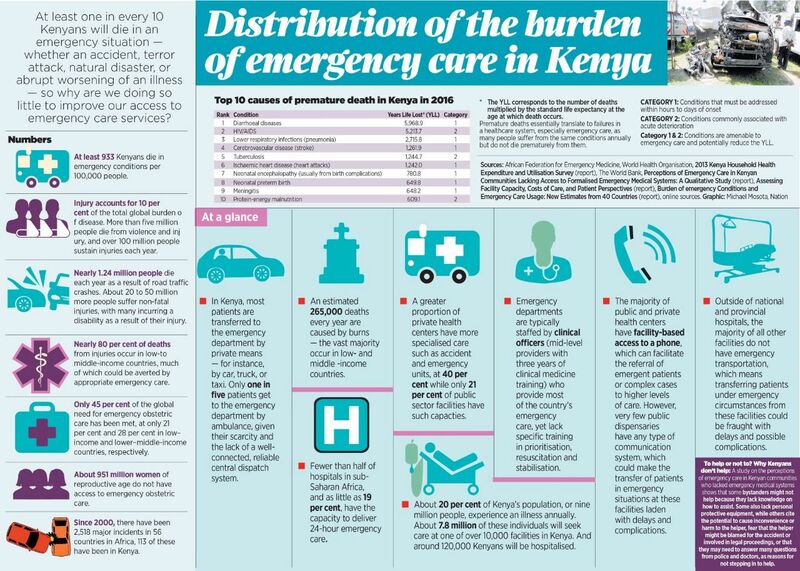 This assessment, conducted by external EMS experts with expertise in African and international EMS systems and EMS education, reports several key findings and offers important recommendations to help standardise and enhance the quality of training in Kenyan prehospital care. A standard Kenyan EMS scope of practice (document and policy) is needed that defines levels (i.e. tiers or cadres) of EMS providers and delineates all knowledge and skills required to practice as a prehospital provider at the given level. A standard for EMS training should be developed and implemented to help ensure high quality and uniformity in EMS training across institutions, and alignment with the Kenyan EMS scope of practice. There should be a transition from over-reliance on non-Kenyan curricula and training content, to more Kenya-specific materials and content targeted to the local burden of disease, healthcare system, and available resources. External reference texts/material can function as a guide for initial training initiatives and provide coarse structure, but training content should be edited as much as possible to reflect local needs. EMS trainees could greatly benefit from stronger foundational didactic classroom-based education (classroom education) at the Basic (EMT) level with a specific focus on clinically relevant basic anatomy and physiology. This should be limited to the knowledge and basics directly relevant to their scope of practice. To improve foundational clinical training in emergency care, all trainees should first achieve competencies and attain adequate field experience at a basic (EMT) provider level, before receiving additional training to higher qualifications (e.g. Intermediate Life Support (ILS) or Advanced Life Support (ALS). Higher-order and critical thinking skills need to be developed, by integrating basic knowledge and skills into real-world clinical scenarios, which should be heavily woven into all aspects of EMS training programs. Access to quality emergency services is an essential component of the human right to health, but barriers to emergency care are found throughout Africa and the wider world. Data to support the development of emergency care are essential to improve access to care and further infrastructure development. We undertook this study to understand the community’s emergency care needs and the barriers they face when trying to access care and to engage community members in developing high-impact solutions to expand access to essential emergency services. To accomplish this, we used a qualitative research methodology to conduct 59 focus groups with 528 total Kenyan community member participants. Data were coded, aggregated, and analyzed using the content analysis approach. Participants were uniformly selected from all eight of the historical Kenyan provinces (Central, Coast, Eastern, Nairobi, North Eastern, Nyanza, Rift Valley, and Western), with equal rural and urban community representation. We found that socioeconomic and cultural factors play a major role both in seeking and reaching emergency care. Community members in Kenya experience a wide range of medical emergencies and seem to understand their time-critical nature. They rely on one another for assistance in the face of substantial barriers to care: a lack of a structured system, resources, transportation, trained healthcare providers, and initial care on scene. The results of this study indicate the need for specific interventions to reduce barriers to access essential emergency services in Kenya. Access to emergency care can be improved by encouraging recognition and initial treatment of emergent illness in the community, strengthening the prehospital care system, improving emergency care delivery at health facilities, and creating new policies at both county and national levels.